So these plants are considered to be ‘geophytes’ because they have underground storage organs, but I find this so-called classification to be much more meaningful than that for the tuberous perennial Claytonia. In order to better understand this, let me break it down a little bit. Phyte – Greek, generally referring to a plant. Geo – Greek, generally referring to anything of or relating to the Earth. 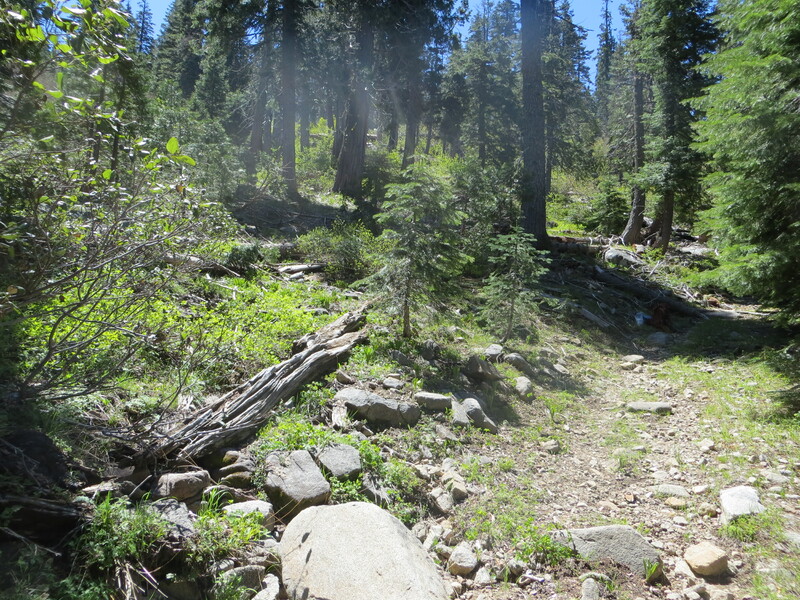 Pictured here is the habitat of the typical variety for the Claytonia lanceolata complex, C. lanceolata sensu stricto. At least in northern California, this taxon is known only from soils derived from granitic rocks. The suggestion has been that as a generalist, C. lanceolata (as currently circumscribed) occurs in a variety of habitat types across its range and thus is highly polymorphic morphologically. 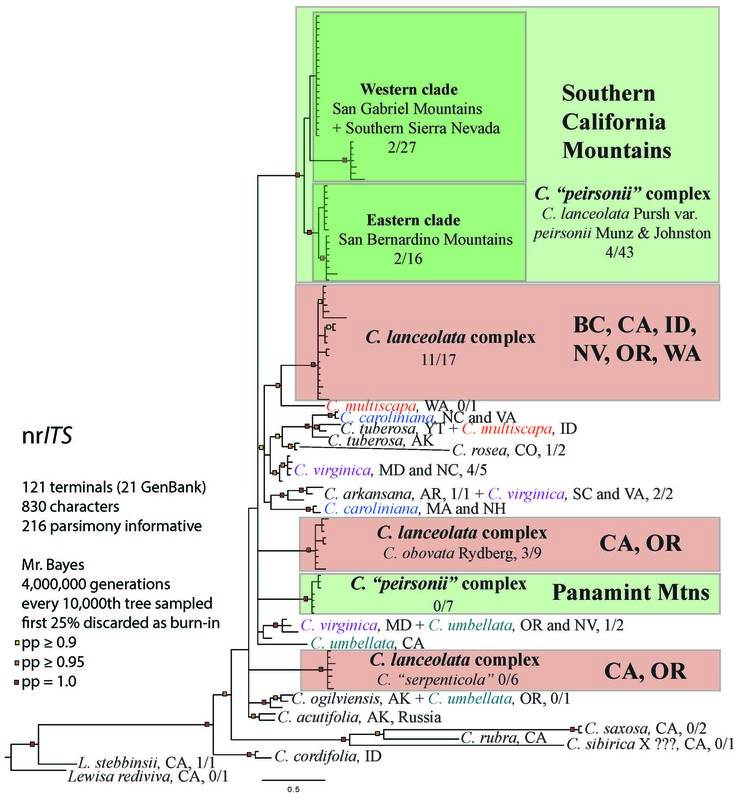 Well, there are some interesting substrates in southern California within very close proximity where one can find members of C. “peirsonii” complex occurring in nearly equivalent niche space across different substrates… Wait a second, am I studying geology or botany?! 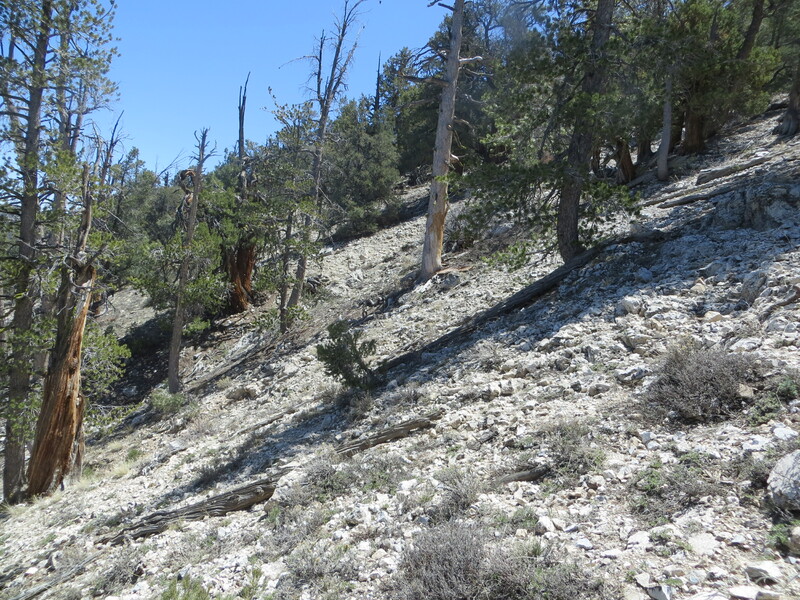 Because bragging about how awesome the San Bernardino Mountains are is my favorite thing in the world to do, I’d like to take this opportunity to point to some interesting Claytonia there that occur on sedimentary carbonate rocks on the north slope of Bertha Ridge. 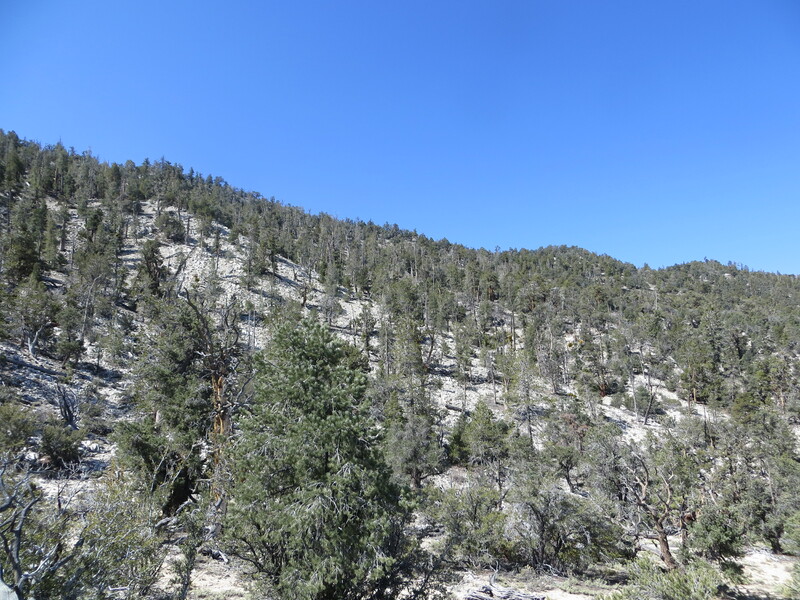 This is the ridge that separates Big Bear Valley to the south from Holcomb Valley to the north. This is where I first encountered plants that match the description of Claytonia lanceolata var. 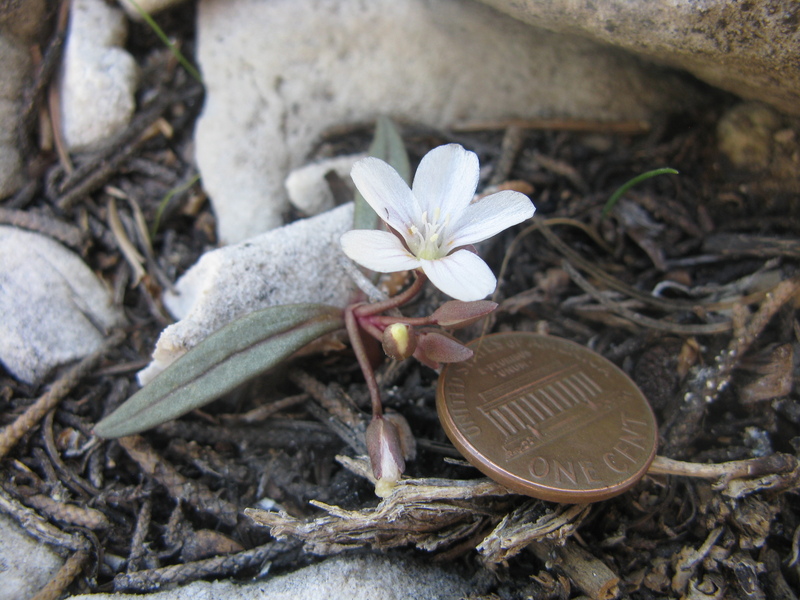 peirsonii Munz&Johnston, or any plant treated as Claytonia lanceolata in the Jepson Manual or Flora of North America, while I was working as a Rare Plant Technician for the USDA Forest Service on the San Bernardino National Forest. More pictures of these plants can be found on CalPhotos. These plants, as mentioned previously, are ridiculously cute (see related articles below and cast your vote!). 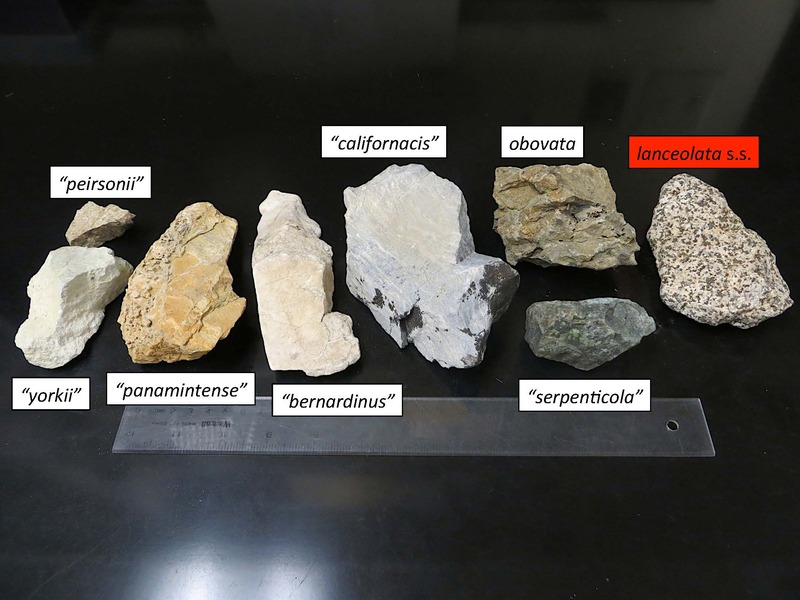 More importantly for this story, these plants occur on dolomite, which is a particular type of carbonate rock containing the mineral dolomite. And boy-howdy are these rocky hills STEEP! Unfortunately, this is an aspect of the habitat that many of the tuberous perennial species of Claytonia appear to have conserved across lineages, making field work incredibly physically demanding when sites are remote. But what is my point, exactly? 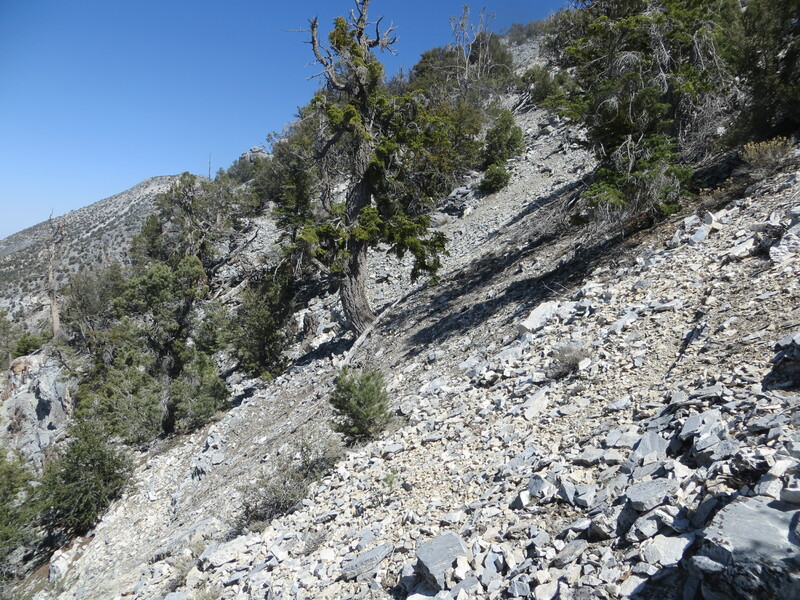 Pictured here, approximately 7 air-km to the north, there exists another population of tuberous perennial Claytonia that is primarily associated with the same species (Pinus flexilis, P. monophylla and Juniperus) but otherwise occurs on a different kind of carbonate rock than the population at Bertha Ridge. This becomes significant when you look at the morphology of the plants here, which is inconsistent with the plants at the Bertha Ridge population just 7 air-km away. Although it is all C. lanceolata for now, soon enough we’ll make some sense out of it! 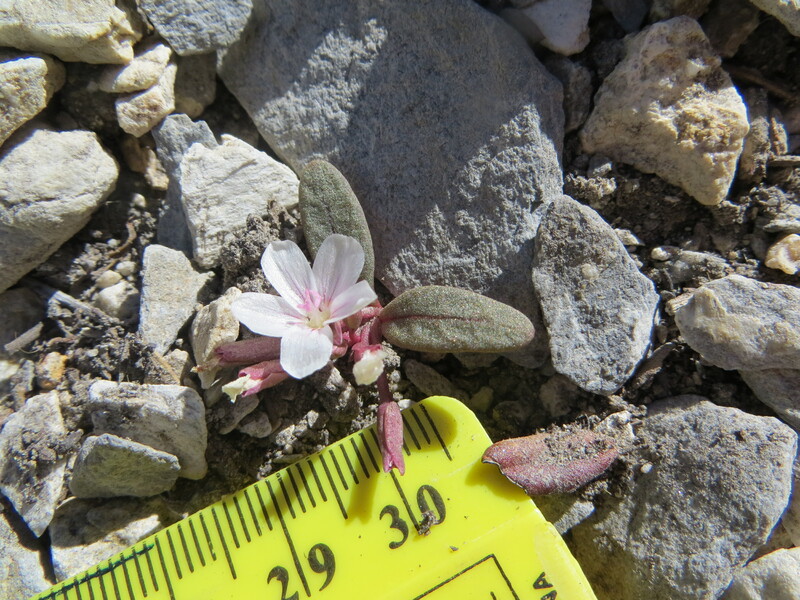 This entry was posted in Claytonia lanceolata species complex and tagged carbonate rocks, Claytonia lanceolata, Claytonia lanceolata var. peirsonii, dolomite, Geology, limestone, Morphology, San Bernardino Mountains, southern California, Speciation by tstou10. Bookmark the permalink. Very cool! It might be worth looking into crypsis in these plants as well. Are they matching local soil color, and could that have an influence on speciation?